It’s not every day you run across a melon in the bike lane. Or maybe this was a squash. I’m not sure. But this is the harvest season. And I think it serves as a good reminder of the possible benefits of wearing a helmet. Crashes can hurt, as we learned from those TV crash test dummies, Larry and Sergey. Remember them? Oh, wait. Larry and Sergey are the Google guys. The crash test guys are Larry and Vince. 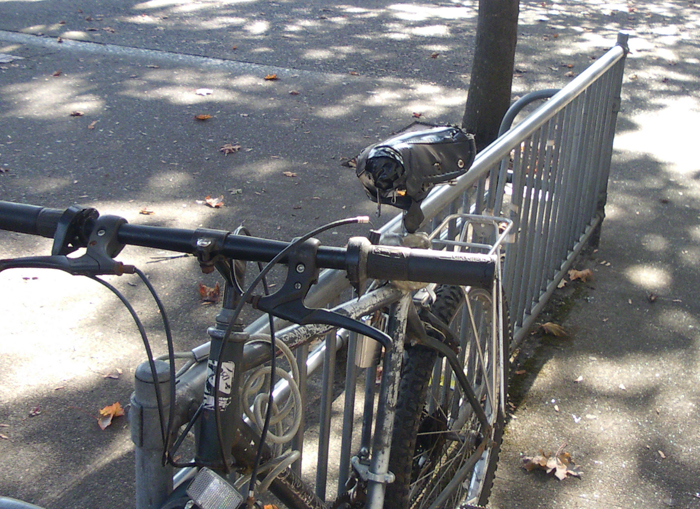 You may remember this summer we discussed the removal of parking meters in Eugene and how this was going to doom dozens of bike parking spots in the greater downtown core. Some were concerned this would make it too hard to find a convenient place to park your bike downtown. I wasn’t sure. Lest you think that means no parking enforcement downtown, you can actually see the little parking ticket scooter over in the right of the frame. That’s because, while parking is free, it is free for just two hours — at which point it may well cost you the price of a parking ticket. What this means for bicyclists, of course, is that all is not lost. In order to inform motorists of the two-hour rule, the city had to install signs. They conveniently attatched them to the old parking meter posts. A quick tour around some parts of the new free-parking zone would seem to indicate these signs were attached to about half of the old posts, maybe a bit less than that. But I can’t say I actually counted. The good news is that if you can’t find a place to park your bike — like, you know, in that actual bike rack in the background — you can lock your bike to this post/sign. As you can see, someone has decided to take advantage of this already by parking their newspaper at this particular sign. However, if you are still concerned about the quality and/or quantity of downtown bicycle parking, here is a fabulous idea from — where the hell else? — Portland. A new bar opened there recently, on MLK Boulevard, that is themed on the Portland Trail Blazers 1977 NBA championship. It is called the Spirit of 77. Those two signs anywhere would definitely cause me to stop and have a look around. And so the most fantastic thing about the Spirit of 77 — in my humble opinion, which is based on the fact that I haven’t actually been there — is that it appears you can actually park your bike inside the bar. So if there are any businesses in downtown Eugene that consider themselves exceptionally bicycle friendly, and have a little bit of room to spare, take note. All the rest of you, get out there and start stuffing suggestion boxes. What else do we have rattling around at the bottom of our panniers today? Well, I sometimes have to wonder what bikes are up to in the middle of the night when no one is around. I think I have figured out something, though. I think — in the wee-est hours of the morning — they put on gloves and box. … setting up a crushing left hook. Parking inside is going too far. It’s a bike! Yeah, sure, but it’s Portland! Theres a bar in SF that’s got indoor bike parking–Gestalt. Seems a little gimicky. Eh. It looks like the whole bar is bike themed. Also, there was a water melon in the Fox Hollow bike lane just the other night. What’s with melons? Another street melon spotted the other day. This one at 22nd and Kincaid. ← What *is* a brake?